By 1976, the glam rock that had made Suzi Quatro famous was on its last legs as disco overtook the airwaves and punk rock festered in the clubs. However, Quatro was not going to give up the fight easily, as proven by «Aggro Phobia». This set, produced by British pop mastermind Mickie Most, is a lightweight but tuneful collection of pop/rock. Nothing here hits the manic heights of «Can the Can» or «Devil Gate Drive», but all the songs are solid and listenable. The big surprise this time out is the strong country-rock feel to a number of the songs: the cover of Steve Harley's «Make Me Smile (Come Up and See Me)» places barnstorming acoustic guitar hooks where fat power chords once existed on Quatro's past hits, and «American Lady» soulfully combines organ and acoustic guitar riffs in a manner reminiscent of Rod Stewart's earthy early hits. Another country-ish highlight is «The Honky Tonk Downstairs», a rollicking love lament worthy of Tanya Tucker. However, glam rock is not entirely abandoned on this album: «Tear Me Apart» works a series of rumbling power chords to create an effective mid-tempo rocker about a hard-loving woman. There is also a great remake of «Heartbreak Hotel», that recasts the song in a sultry power ballad style to create one of Suzi Quatro's finest non-hard rock moments. 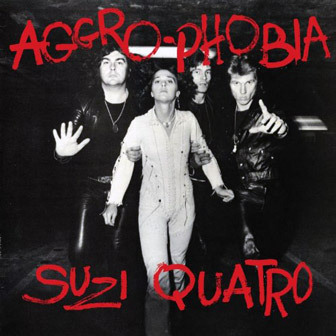 In the end, «Aggro Phobia» lacks the stellar songs that would win new fans to the Suzi Quatro cause but it is a well-crafted and tuneful release that the singer's fans will definitely want to hunt down. — Donald A. Guarisco. Recorded on the RAK Records Mobile, at the Chateau du Regard, Coye la Foret, Oise, France.